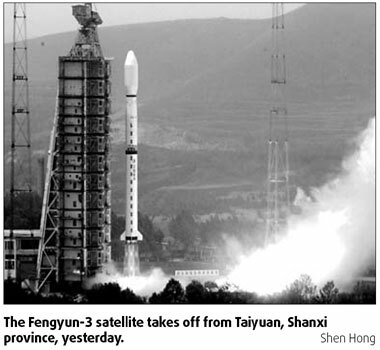 China launched a second weather satellite for the Olympic Games, the Fengyun-3 (FY-3), yesterday in Taiyuan, Shanxi province. Zheng Guoguang, director of the China Meteorological Administration (CMA), said the FY-3 will work with the existing Fengyun-2 to ensure timely weather forecasts during the Beijing Olympic Games. The FY-3 will send back images with a spatial resolution of 250 m and its temperature sensitivity will be in the region of 0.1 degree F. Both indices are close to the most advanced satellites in the world. Currently, the highest spatial resolution of existing satellites in China is 1.1 km. The satellite is equipped with advanced detectors such as an infrared scan actinograph and a microwave formatter. "It is able to carry out three-dimensional, all-weather, multi-spectrum quantitative detection and acquire data from ground surfaces, oceans and space," Wang Shourong, CMA deputy director, said. 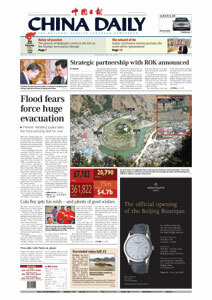 Experts said the data collected will not only facilitate weather forecasting in China but also in other countries. The World Meteorological Organization, Europe's METOP and NPOESS in the United States will use the FY-3's data to detect changes in the atmosphere, oceans and ground surfaces, the CMA said. The 2,295-kg satellite will provide accurate and timely information to facilitate more precise weather forecasts during the Olympic Games, the CMA said. It said the satellite, with a bigger payload, will provide medium-range weather forecasts - 10 to 15 days. China has launched eight meteorological satellites since research started in the 1970s. Its first Olympic weather forecasting satellite, the FY-2D, was launched at the end of 2006. It was announced earlier that China will launch another 22 meteorological satellites by 2020, including four more from the Fengyun-2 series, 12 from the Fengyun-3 series and six from the Fengyun-4 series.